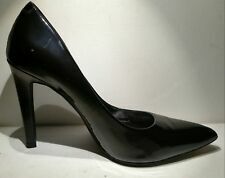 Black Faux Patent Leather Slingback Peep Toe Platform Heels. Sides of both shoes are clean. Shoes are in pre-owned condition and show signs of normal wear. Heels and toes of both shoes show dark stains. Insoles and inner lining are clean. Bottom soles are dirty and show signs of normal wear. Brown leather upper with side buckle. Heel is faux wood. Gently worn condition. These shoes are Preowned in condition. They have not been cleaned. We photo every angle. New may not be a current model/style. Item was not previously sold. Pre-owned - Item can be in excellent, very good, good, fair or up cycle condition Excellent - Looks as though it was seldom worn and was cared for very well Very Good - Little wear or signs of use. Shoes show sign of regular use. Overall in good preowned condition. See photos. Fabric Upper. Shoes Size 9.5 M. We will resolve any issues in a friendly manner. Order Cancellations.